Program director S.K. Ramesh welcomes students and visitors to the third annual AIMS2 Research Symposium event in the USU Northridge Center. Photo by Lee Choo. More than 40 students presented and displayed their research projects at the third annual AIMS2 event. Photo by Lee Choo. 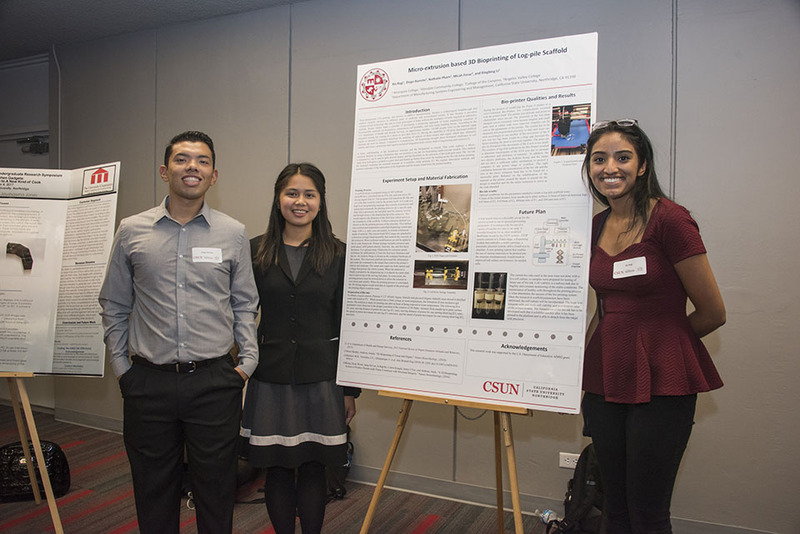 Students present research work at the third annual AIMS2 event Oct. 4 at the Northridge Center. Photo by Lee Choo. 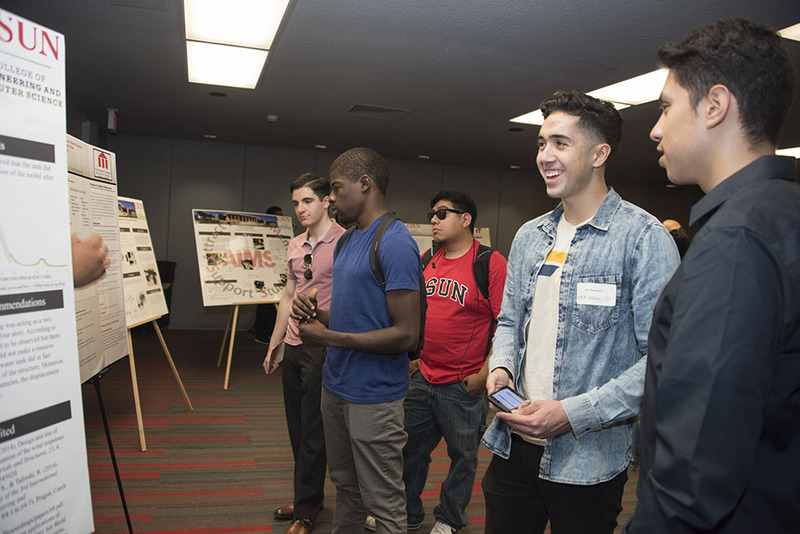 In early October, the third annual Attract, Inspire, Mentor and Support Students ​(AIMS2) Research Symposium exhibited the yearlong research projects of more than 40 students in California State University, Northridge’s College of Engineering and Computer Science. Engineering and computer science faculty organized the symposium to give students enrolled in the AIMS2 program an opportunity to present their projects in a professional forum. The U.S. Department of Education has funded the AIMS2 program for the past six years, beginning with the initial grant in 2011. In 2016, the CSUN program’s collaborative grant was renewed with a $6 million grant. The original grant was designed to support low-income, economically disadvantaged and underrepresented Latino students and other students of color interested in majoring in engineering or computer science. Program director S.K. 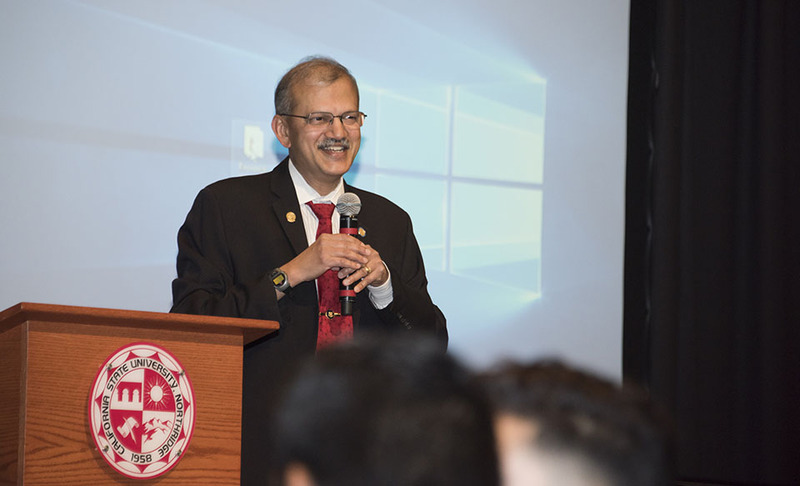 Ramesh, former dean of the college and currently a professor of electrical and computer engineering, hosted the free event in the University Student Union’s (USU) Northridge Center. Students enrolled in the AIMS2 program have access to academic resources such as professional mentors, tutors, educational field trips, workshops, grants, $500 semester stipends, career opportunities and paid internships for undergraduate research participation. At the Oct. 4 research symposium, under the direction of faculty mentor Vahab Pournaghshband, computer science major Aren Mark Boghozian presented his collaborative research project, Simulating Network Discrimination by Intermediaries on the Internet — which aimed to improve internet speed. A first-generation college student, Boghozian started his higher education at Pasadena Community College and learned about the AIMS2 program through an email campaign. In the AIMS2 program, Pournaghshband mentors nine CSUN students, working to ensure that their academic needs are met. Unsure of where to go after completing community college, junior Christina Seeholzer made the decision to transfer to CSUN to major in mechanical engineering and minor in physics, with the assistance of the AIMS2 program. At the symposium, Seeholzer presented her collaborative research project, Smart Kitchen Gadgets: Opening the Kitchen to a New Kind of Cook, with faculty mentor Shereazad (Jimmy) Gandhi. The first five-year AIMS2 grant served approximately 250 students across seven cohorts at CSUN. Currently, the program includes 91 students in four cohorts. College of Engineering and Computer Science faculty lead the project in partnership with faculty from CSUN’s Michael D. Eisner College of Education and College of Science and Mathematics — as well as Glendale Community College, College of The Canyons, Moorpark College, Los Angeles Pierce College and Mission College. Initially, the program focused on supporting transfer students, but is now open to all first-time freshmen as well. Excelencia in Education recognized the AIMS2 program in 2014, and the program earned a Bright Spot in Hispanic Education award in 2015 from the White House Initiative for Educational Excellence for Hispanics. According to Ramesh, students who have successfully completed the program are now “bridging the gap” by graduating at the same rate or just as fast as their better-served peers. AIMS2 is being used as an academic model nationwide. The program’s primary goal is to improve students’ research skills by introducing research projects early on in their educational careers. To learn more or get involved with the AIMS2 program, please visit http://www.ecs.csun.edu/aims2.